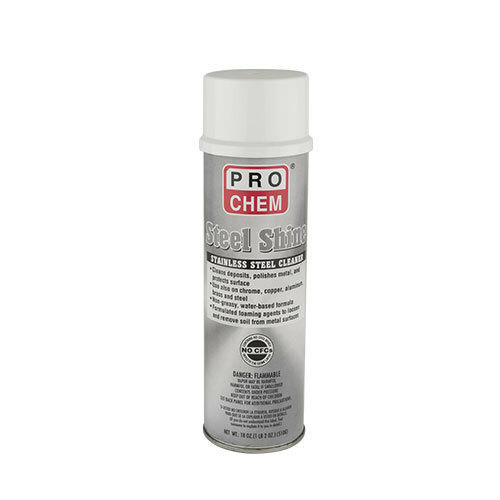 STEEL SHINE | Pro Chem, Inc.
STEEL SHINE, a water-based stainless steel cleaner, has a clinging foam formula that instantly loosens and removes soils from most metal surfaces leaving a glossy, protective coating behind. Because it is an oil-based emulsion, the solvents have been removed and replaced with water. Not only does this eliminate the oiliness and high flammability found in solvent-based stainless steel cleaners, it also lowers the VOC’s making it more environmentally friendly. It contains no abrasives so it will not scratch the surface. Use of a highly refined oil for the emulsion makes it the perfect solution for food preparation areas that need a product that cleans and leaves a protective shine. Shake well before using. Spray evenly over the surface to be cleaned from a distance of 8-12 inches. Wipe area clean. For heavily soiled areas a second application may be necessary. Note: Product does not remove existing tarnish. If tarnished, use Metal Brite #220001.